Walter Harrison's Green Die-Cast Seed Feeder has been designed specifically for the garden bird enthusiast, giving the ultimate bird feeding experience. Easy to clean and simple to fill, the Feeder is made of weather resistant materials and features small perching areas for birds to feed from. I purchased a 4 hole bird feeder. The description provided pretty much sums up the product and with a lifetime guarantee, what more can you ask for?! 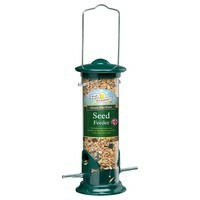 The feeder is cylindrical in shape with two feeding holes halfway down and two at the bottom. it has a firm plastic casing with metal base and lid. Seed is put in at the top and with a large metal hanging loop, depending on where you're trying to hang it, you could probably find a branch suitable to hang it directly from the tree. Personally, I have some large S shaped hangers which I've attached mine to. It can hold seed and small pellets and my garden birds love it. Nice product.